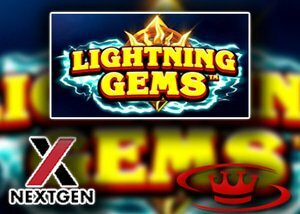 NextGen Gaming, experienced developer of successful slot games for online and land-based markets around the world just announced the release of their latest online game titled Lightning Gem Slot. This innovative creation is a nautical lightning spectacle featuring electrifying graphics exploding with lucrative payouts that will go live soon across mobile as well as on desktop platform at all NextGen casinos across the globe. Lightning Gems features 5 reels and 10-payline, with a dark fantasy theme. The background shows a mountainous landscape, while the reel grid is invisible and makes the symbols look like they are floating on the screen. Visually, the game is built on rich 3D graphics, with symbols that glisten and glow at all times, while an atmospheric soundtrack plays in the background. In addition, the min and max bets players can lay - range from 0.15 to 150, depending on the currency played. The high-value symbols on the reels are all gems and jewels of various colours, while the playing card suits make up the low-value symbols. The scatter symbol is a bright crystal with electricity going through it. Finally, the wild symbol is a gold circle which is the only symbol that appears stacked on the reels. Wilds can substitute for all other symbols apart from the scatter. Also, getting 5 of them on a winning line will award 500 coins. New Lightning Gems Slot showcases two of the main features namely the wild nudges and wild wins. The wild nudge attribute is the most important bonus of the game and is activated at random. Any non-winning spin can spark this feature, and when this happens a wild will emerge to create a winning combination. The wild will then nudge into place on the reels to help create even more payouts. This attribute can be activated in the course of the main game and free spins feature. The wild wins attribute is another randomly awarded bonus game. Extra wilds can be added to the reels at any given time. In Addition, look out for the scatters. Spinning three or more scatters starts the free spins bonus. 10 free spins are awarded with 10 extra wild symbols added to each reel for a total of 50 for all free spins. New Lightning Gems slot is reckoned as a medium volatility slot machine with an RTP of 96.48%. The biggest possible win is 2000x the stake and players can get it by landing 5 scatters in one spin. This is a very simple and traditional video slot, with two interesting random features and a rewarding free spins feature. Furthermore, the design and graphics are great, and so is the fairy tale sounding soundtrack. As an online betting review site, we recommend you visit Orient Express Casino the number one choice for real money Canadian punters. You can start by trying the games, courtesy of a no deposit offer amounting to $10 with code CBK10. If you like what you see, then you can sign up. When it comes to delivering mind-blowing features, Orient Express Casino has got you covered with their extensive range of special offers. For those who are new to the casino, your initial deposit at Orient Xpress Casino unlocks a free 250% bonus valued up to $500, which ensures you get off to the best possible start. The welcome bonus immediately doubles your casino gaming funds offering double the fun and more importantly double the winning opportunities. Bonus funds can be enjoyed on any games part of the great gaming library including brand new releases or featured games. If you want to play the new Lightning Gem Slot and take advantage of the NextGen No Deposit Bonus why not visit Orient Express Casino today.